In this complex and noisy world of too many choices, a small business can stand out from the competition with simple marketing. 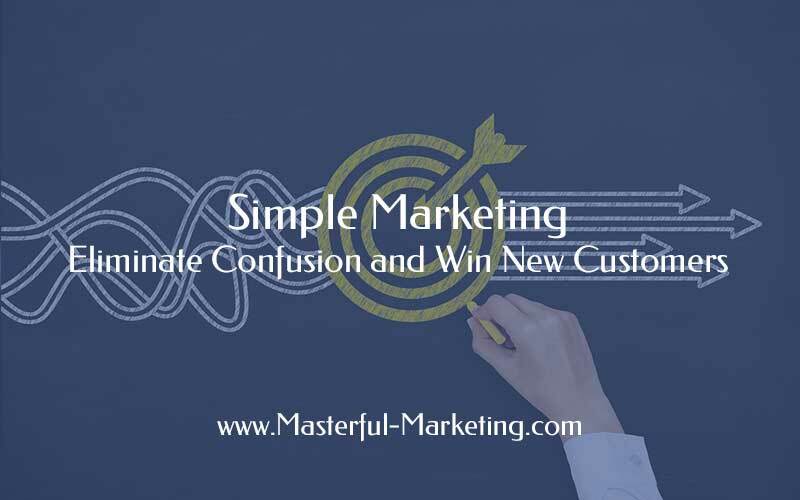 Simple marketing also helps business owners eliminate the marketing overwhelm due to the rapidly changing digital landscape. Marketing overwhelm creates paralysis, guaranteeing that nothing gets done. Plus those activities that do are often random and ineffective. No one has time to sort through complex messages, confusing web design or too many options in order to find what they need. Customers are looking for simplified experiences throughout the buyer’s journey. The business that can deliver their solution with clear messages and a simple pricing and packaging model will win the customer. Online marketing requires action on a regular basis. You can no longer just place an ad in the Yellow Pages and then go about their daily business activities. 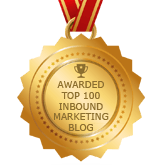 To implement a successful inbound marketing strategy, content needs to be continually created, optimized and promoted. With all the options available, small business owners feel totally overwhelmed. Plus they redirect their efforts every time something new catches their attention. Picking the right target market enables you to become laser focused on addressing their particular challenges. If you try to market your products and services to an undefined audience, you most likely will fail. Many business owners avoid making a decision to target a specific market niche. They try and be “all things to all people” because not making a decision feels less risky. That is far from reality. Being clear about who you work with increases efficiency, eliminating wasted time and money on activities that are random and unfocused. And despite being a prominent marketing myth, defining a target market will not limit your business. Directing your marketing efforts towards a specific market increases the clarity of your message and heightens your visibility to a much broader market. Creating a simple marketing plan helps you choose strategies that are focused on attracting your ideal client within your target market. Without a simple marketing plan, you may be selecting marketing activities as you would food from a Chinese menu. However, when it comes to marketing, the Chinese menu approach does not work and usually results in a bad case of heartburn. With so much distraction in our day-to-day activities, we need to put structure around our marketing so we remain focused on our goals. We have only so much time to devote to marketing, so let’s use that time wisely. Crafting messages that are simple, compelling and focused on the problem you solve for your ideal client creates visibility across a wider market. Too many companies create complex messaging. Figure out what your ideal client wants and focus on the most important point that you want to communicate. Let your audience know what problem you solve for them and why they should work with your business. Avoid drowning your prospects with too much information about what you offer. Remember that your potential customer only cares about what you can do for them. Present your solutions simply and in their language so it is easy for them to make a decision. Clear messages can help them move swiftly through the sales process. Developing an action plan helps you define a realistic set of activities based on your resource limitations. A marketing action plan eliminates random activities that create haphazard results. It takes your marketing plan one step further and assigns dates, topics and other activities to each activity so that it eliminates the guess work and ensures you always know what you should be doing and when. Simplifying your website to clearly guide your visitor helps them find what they are looking for and helps you convert them into a lead. Most small business websites focus too much on how wonderful they are. They don’t tell the visitor why they are the right choice to solve their problem. Some also have a complex design that detracts from its usability. Your web site needs to lead your visitors through the site with the purpose of helping them decide what action to take. If you let the visitor wander without a clear path, you run the risk of them getting confused, frustrated and leaving without ever knowing how you can help them. Make your website design is clean and easy to navigate. If you use a slider or other carousel features, make sure your message doesn’t get missed. Look for a better way to project your message. Write the homepage content so that it clearly speaks to your ideal client. 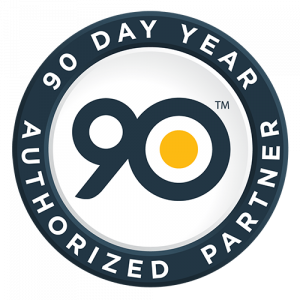 This will help them understand how you can help them solve their biggest challenge. Selecting and then dominating the right social media channels is more effective than trying to create a strong presence across them all. You do not have to be on every social platform in order to make an impact in your business. You hear about how businesses use Pinterest or Twitter to grow their business and you feel you need to do the same. But your strategy is going to look different than others, even against your competition. You need to decide which platforms make sense for you. Take some time to figure out where your target market hangs out and make sure you have a strong social presence there. When you successfully build a strong presence on the more appropriate social channels, you can decide when or if it makes sense to add another to your online presence. 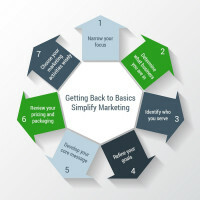 Simple marketing has benefits for both your customers and your business. Keep your marketing simple and help your ideal clients understand why they will benefit from working with you.